Where to eat in Oaxaca Mexico? Where to eat in Oaxaca? The short answer is everywhere. I haven’t had a bad or even mediocre meal here. While I have read great reviews for more formal restaurants, the street food and taquerias are and so good I haven’t made it to any restaurants. I’ve decided to stay a few more days because I haven’t come close to eating everything I want. 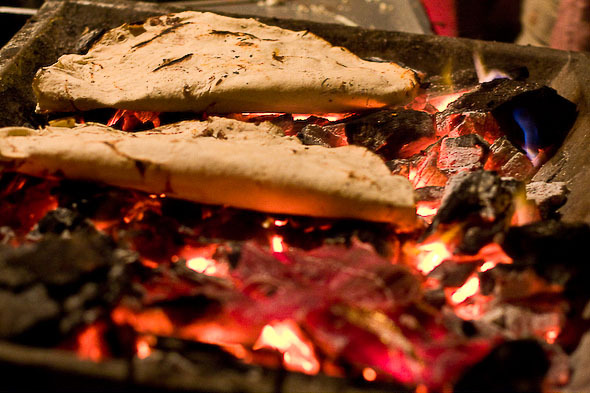 Eating in Oaxaca wasn’t simple at first. I didn’t realize people eat breakfast at 11am, their main meal at 3pm and a light meal at 8 or 9pm. If you’re hungry from 5-7pm you will be stuck with Doritos and Yoplait from the convenience store. And while there is a slew of good recommendations from Rick Bayless and countless other sites, there is only one thing that you cannot miss. Tlayudas Libres are known throughout the city as the famous street vendor of the traditional Oaxaqueña food, tlayudas. While in all of the tourist photos tlayudas look like a tortilla pizza with a crispy tortilla crust topped with meat, cheese and cabbage, they are only served like that at formal restaurants. If you want the real deal, they are served closed so it’s easier to eat. I met up with an American chef, Robert, from my Spanish school who wisely suggested that we split one as he had eaten there the previous night and couldn’t eat more than half. It all begins with a topping of asiento, a delicious rendered pork fat which is spread onto a large, freshly made tortilla. Don’t worry if you’re vegetarian as they ask if you want it but how could you not? 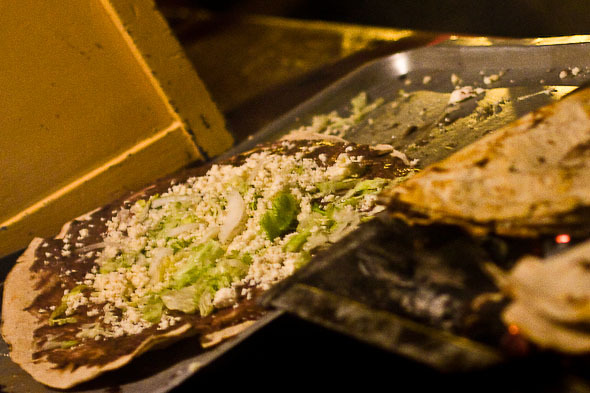 It’s then topped with refried black beans, cabbage and cheese, folded and thrown onto the hot coals. You then can choose what type of meat you’d like with it; course, I chose the chili crusted pork. As we sat and ate the pork on pork deliciousness, I watched car loads of people double park to pick up several tlayudas to go. Although there are peak times, particularly when the bars close, there are a steady stream of locals visiting the stand all night. 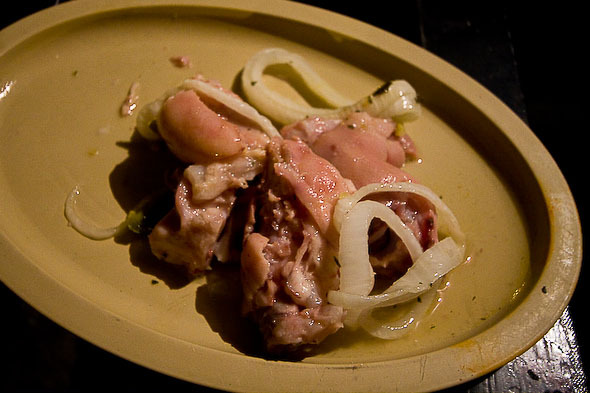 I returned the next night, but this time I had something else in mind – pickled pigs feet. Rick Bayless recommended it and with my professed love for pork products I felt a sense of duty to try it. I wasn’t cautious about the pig feet part, rather the pickling. Other than pickles and beets, I can’t think of a lot of things I’d like to eat pickled. 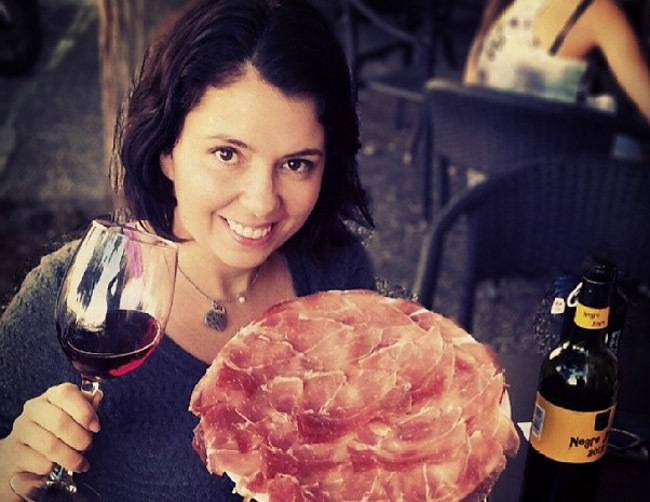 I was pleasantly surprised by the meaty texture and smokey sweet flavour of the feet. I would have preferred it to be a little less fatty, but the ladies at Tlayudas Libres can’t help it that pigs have cankles. Tlayudas Libres can be found at 210 Libres just South of Murguia. I guess after Hokatika any food is game! Hit this town early on my trip and really, really liked it. Might need to get back there soon. This makes me hungry. Thank you for the info on where to eat. And, awesome images! My abuelita would put pigs feet in her menudo and they were the first thing I would go after (if my abuelito did not claim them first). This looks amazing! I would eat almost anything, but I harbor a life-long fear of anything pickled. The tlayudas sound amazing! Oh yes, I have good memories of Oaxaca and the food. 🙂 Didn’t eat the pig’s feet though. Then you must go back!